After months of engineering and development, cp-e™ is proud to release the ΔCore Ford Fusion 2.0T FMIC. 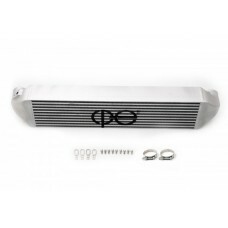 The stock intercooler does an excellent job for the everyday driver that doesn’t want to modify their car. However, once you find that itch to go faster, the intercooler is a must have modification. cp-e™ started off by determining the maximum size core that could fit without major modification to the vehicle. Our Ford Fusion 2.0T FMIC uses the bar and plate design to help ensure a high level of efficiency. cp-e™ then set their sights on designing the perfect Ford Fusion 2.0T FMIC endtanks, developing a design that not only encloses the monstrous core, but also requires no cutting, no drilling, and no permanent modification to the vehicle. With the laser cut brackets, the intercooler will mount in the stock location while matching up to the stock intercooler piping. Customers can now upgrade their piping when their power demands need it and modify in smaller increments.